"It's That Way-Out Whopper Of A Funny Western...A She-Bang To End All She-Bangs!" Jane Fonda stars as the main character, Cat (Catherine) Ballou, an earnest teacher who after receiving her training and education decides to return to Wyoming. Riding home, Cat befriends some con men, Clay (Michael Callan) and Jed (Dwayne Hickman). Reaching her old home, Cat finds that her father, Frankie (John Marley), is being intimidated by a company that wants his land. When Frankie is killed by the company’s man, Tim Strawn (Lee Marvin), Cat decides to defend the homestead, convincing the con men, Clay and Jed, her dad’s employee, Jackson Two-Bears (Tom Nardini), and Kid Shelleen (Lee Marvin), a gunslinger once quick on the draw and now an alcoholic, to work with her. 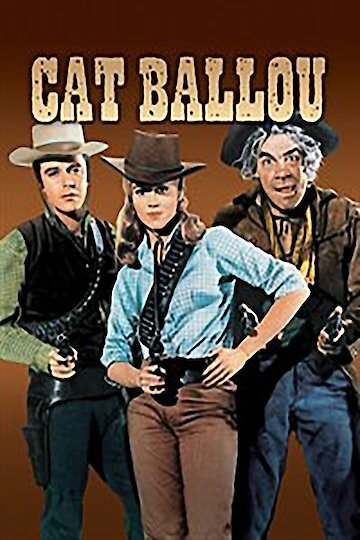 Cat Ballou is currently available to watch free on The Roku Channel and stream, download, buy on demand at Amazon, Vudu, Google Play, FandangoNow, iTunes, YouTube VOD online.